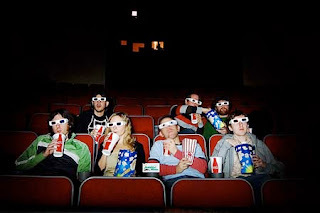 Krista Lynne Jensen: Are You Writing Cinematically? At writing group I was explaining how certain events unfold in my WIP. I kept on saying things like, "Well, at the beginning of the movie..." or "by this point in the movie..." and "I'm not sure about this part of the movie..." and my group-mates were laughing because I kept having to correct myself and I was getting flustered. No, I do not have grand aspirations of someday seeing my novel on the big screen. I do not picture movie stars playing my main characters (not that there's anything wrong with that). I do not dream of signing movie deals. I just don't. I simply see what I am writing so vividly in my head, the characters playing out their scenes and dialogue as I type, keeping up with the action or banter or emotion, there is a glitch in my stored vocabulary that has me calling my book a movie. It's a movie in my head and I'm writing it as I see it, hear it, smell it, feel it. But it's a novel. I know it's a novel. A book. Not a movie. But, I watched Sherlock Holmes last night, and saw Robin Hood in the theater last week, and I am reading David J. West's Heroes of the Fallen. 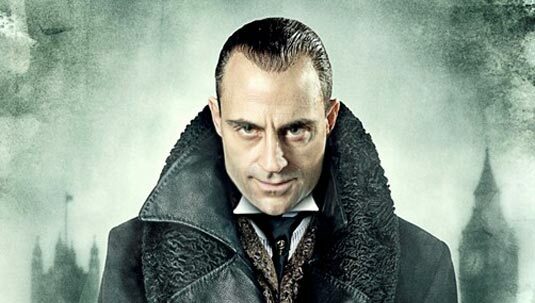 The actor, Mark Strong, who plays a villain in both those movies, keeps popping in my head as the image of Akish-Antum, the arch villain of Heroes. So it got me thinking, is there an actor or actress that could be the ideal for one of my characters? And then I started to laugh. Because I remembered a pair of actors I had in mind when I wrote two lesser characters of The Orchard. And admitting this is SO going to date me. 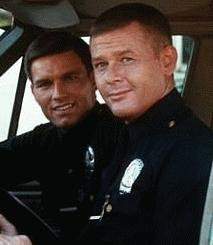 They are Officers Jim Reed (L) and Pete Malloy (R) from one of my favorite childhood TV shows, Adam 12. This is pre-CHiPs, people. Officer Reed was right up there with Donny Osmond, Shawn Cassidy, and my neighbor, Robby Johnson, as far as my kindergarten crushes went. Meet Will Eliot and Uncle Jay Whitney, from my novel, The Orchard. Well, it's televison... not film. Right? Do you picture actors when you're forming your characters? Or when you read? Is there a movie in your head when you write? Thanks for the mention Krista-I'm flattered that one of my current favorite actors popped into your mind to play a major villain. I based Zelph on Charles Wilcken who is not an actor, but a very interesting Church History figure. I took his story and changed it from bodyguard to the Kaiser and Johnstons Army to Xoltec and the Lamanite Invasion. Very interesting, David! And yes, Wes Studi is obvious. Cool. I totally picture my characters--to the point where I freaked out in a parking lot once because I saw a guy who looked JUST LIKE one of my characters. I laughed myself silly at the scene in Stranger than Fiction where Emma Thompson's character walks in and she flips out. She'd KNOW exactly who he is--and I imagined how I'd react if, say, Abe were to walk into a room. I'd wig out, but I also like to think I'd give him a big hug and then sit down for a long chat. Your comments reminded me that after I started writing my 2nd novel, I kept letting the male lead character (Ryan) slip into the voice of the male lead of the first book (Derick), which was really annoying! They are totally different. So, I found Ryan on the JCPenney website, printed him off and stuck him above my desk. Problem solved.